If you thought storm chasers are just those people who run after tornadoes and other severe weather for the thrill of it, you’d be mistaken. There is another type that has more to do with greed than thrill seeking. 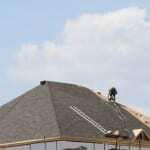 Storm chasing roofing companies are looking to make fast money and usually at your expense. They give professional roofing companies a bad name, but it is easy enough to spot these people and avoid being their next victim. First of all, these people only appear after a severe storm has hit an area. They put together a crew and start knocking on doors. They use aggressive tactics to talk you into roof repair or replacement that you may or may not need. While it can be scary to think your roof is damaged and putting your home at risk, don’t make a hasty decision. They may tell you that you need roofing work when yours has not even been damaged. Reputable roofing companies don’t usually go door to door, so that is your first tip off that something isn’t right. Another indication is if they promise you can get a new roof for free because they’ll make sure the insurance company pays for it and they’ll cover your deductible. It doesn’t work that way. Never sign paperwork that allows them to handle your claim. What usually happens is they bill the insurance company more than they told you or they take the money and run without doing the work. Always take the time to research the company. Check to see if they are local, if they have a license, how much experience they have, and if there are any complaints posted online. If they try to push you for a decision, push them out the door. There is no good reason to rush into a decision that could leave you broke and without a new roof, or with one that is done cheaply and won’t last. Avoid storm chasing roofing companies by going with an honest and reputable company instead. If you suspect storm damage, call us at Slippery Slope Roofing. We’ll inspect your roof and give you an assessment without hitting you with aggressive tactics to rush your decision.